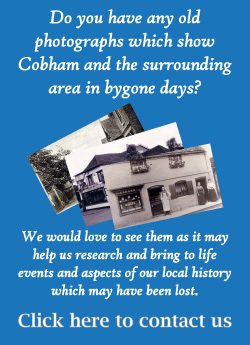 It may surprise you that there are a number of books written about Cobham, produced by the local historian David Taylor. Many of these titles are available from the local bookshop The Cobham Bookshop. There are a number of other titles which sadly are now out of print. "Church Cobham, A Guide and History"
This third book in the series has been written by the local historian, David Taylor and published by the Cobham Conservation & Heritage Trust. The proceeds from this book help to fund the Trust's various Projects. This book provides a brief history and guide to the many interesting buildings that still exist in Church Cobham - the first Cobham Conservation Area. If you would like to buy a copy, either for yourself or as a gift, you can purchase the book direct from the Trust via our Cobham Heritage Publications page or from the Cobham Bookshop. This book has been written by the local historian, David Taylor and published by the Cobham Conservation & Heritage Trust. The proceeds from this book help to fund the Trust's various Projects. The book provides a brief history of the area and includes a guide which takes the reader on a circular route around Downside and introduces them to some of the historical buildings which occupy this attractive conservation area. The book is illustrated throughout with pictures from the past and today. The book provides a brief history of the area and includes a guide which takes the reader on a circular route around the Tilt and introduces them to some of the historical buildings which occupy this attractive conservation area. The book is illustrated throughout with pictures from the past and today. This book replaces The Book of Cobham which was first published in 1982. It traces the history of Cobham from the Iron Age settlement on Leigh Hill down to the Roman era, when a bathhouse (and perhaps a villa) at Chatley Farm were built. By the time of Domesday Book, Cobham had moved to its present position and recent research seems to indicate that a planned village was laid out in medieval times by the Abbot of Chertsey. Cobham grew through the centuries, each of which has left its mark from Cobham Mill, one of the few working water mills in Surrey, to the glorious gardens of Painshill Park and the working Semaphore tower on Chatley Heath. This book is very fully illustrated and will stand as the definitive account of Cobham for many years to come. This, the latest of David Taylor's books, is a highly illustrated publication which commemorates the bicentenary of the arrival at Cobham of the London brewer Harvey Combe. He purchased Cobham Park in a move to establish himself as a country gentlemen and he and his family have played a significant role in the development of Cobham over the past two centuries. However, as the book reveals, the Combe family are relative newcomers to Cobham. The "down" in the park was probably home to prehistoric nomads and recent excavations at Down Farm have revealed evidence of occupation since the Anglo-Saxon period. Before it became Cobham Park in the eighteenth century, the land saw many fascinating owners and occupiers who are all recorded in this book. In 1728 the first Cobham Park mansion was built by John Bridges who probably employed the noted architect Roger Morris to design the house. That house was replaced in the 1870s by Charles Combe, a grandson of Harvey. In the middle of the nineteenth century Cobham was described by a visiting non-conformist minister as being "drenched in drink and wickedness". One hundred years earlier Ogilby's 'Traveller's Guide' described the Cobham as "a town well furnished with Inns". This illustrated book provides a history of all the public houses and inns that are known to have been in Cobham together with a short history of Cobham Brewery which, for over a hundred years, stood on the Portsmouth Road providing employment to many local people. I first became aware of Gerrard Winstanley and the Diggers through the 1962 BBC TV production of David Cautes's novel 'Comrade Jacob' which is loosely based on this episode in our history. Later that year I received a copy of Caute's novel as a school prize and this led to a particular fascination in the events that took place here in the middle of the 17th century. This was perhaps the only time when local events touched briefly upon the national scene, and what happened here in Cobham and Walton caused a shaking at the seat of national government. David Taylor has also contributed a chapter on Gerrard Winstanley at Cobham in "Winstanley and the Diggers 1649 – 1999". This important seminal volume was published by Frank Cass in 2000 and contains the papers given at a conference held in 1999 to commemorate the 350th anniversary of the Diggers occupation of St. George's Hill.